Art on display will include works by Jordan Terry, Monique ‘Mogi’ Gilpin, Zena Nicholson, and Joanna Francis. Music by DJ Sawandi and MXY. 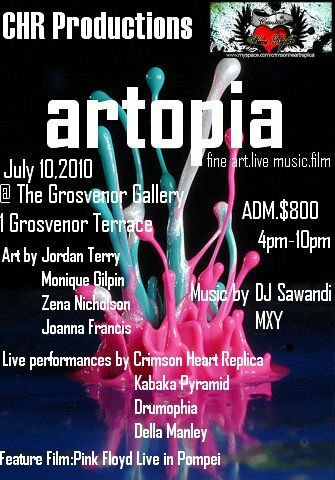 Live Performances by Kabaka Pyramid, Crimson Heart Replica, Drumophia, Infinity, Della Manley, and Mario Evon. Films Flyod Live in Pompei will be shown.